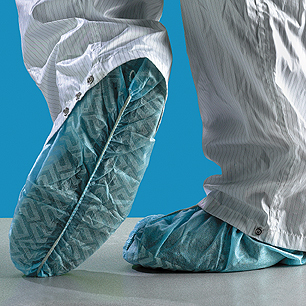 Large selection of disposable cleanroom shoe covers with standard or non-skid bottoms. Available in a variety of materials and options including latex-free, Tyvek, non-particulating, polypropylene, polyethylene, and vinyl sole options. Polyethylen e: Polyethylene is an inex pensive choice for wet applications. Polypropylene: Polypropylene is both cost effective and a breathable shoe cover option. Tyvek®: Tyvek provides an ideal balance of protection, durability and comfort of any limited use fabric technology. Tyvek® fabric offers an inherent barrier to particles down to 1 micron in size. Protection is built into the fabric itself; there are no films or laminates to abrade or wear away. Tyvek® fabric's durability advantage over microporous film and SMS fabrics delivers consistently better barrier, even after wear and abrasion. Applications include: lead and asbestos abatement/remedation, general maintenance/operations, spray painting, and general clean-up.